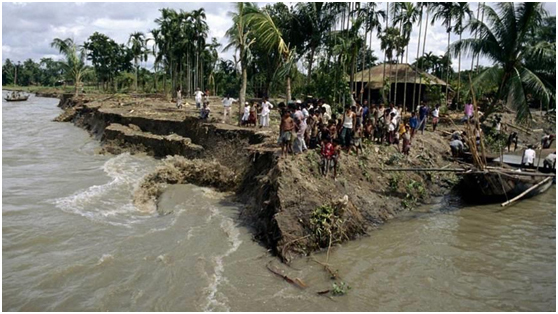 Bangladesh is one of the most vulnerable countries to the impacts of climate change. Global warming has increased the frequency of extreme weather events, such as tropical cyclones, floods, severe rainstorms and droughts. A research project, titled DECCMA (DEltas, vulnerability and Climate Change: Migration and Adaptation) is running in Bangladesh to examine how people are adapting to climate change, such as sea level rise, alongside socio-economic pressures, including land degradation and population pressurein delta regions. In the DECCMA project, Iworked as a Research Assistant in thirteen unions and wards in three different districts (Chittagong, Lakshmipur and Bhola) during the last three and half months. Among these, Char Lakshmi is one of the most hazardous area as it is located besides Meghna River in Ramgati Upazila of Lakshmipur District. The people of the village are mostly erosion-affected people, they lost their valuables in Meghna approximately a decade ago. At first, they took shelter on different high grounds, including roadsides. Many migrated to other places, losing their homes and properties. Later, UNO, local representative of the Government of Bangladesh gave them grants. Every household got nine decimal land to live and some financial support for making home. But according to them, the support was very insufficient. The people of the village are mostly erosion-affected people, they lost their valuables in Meghna approximately a decade ago. At first, they took shelter on different high grounds, including roadsides. Many migrated to other places, losing their homes and properties. Later, UNO, local representative of the Government of Bangladesh gave them grants. Every household got nine decimal land to live and some financial support for making home. But according to them, the support was very insufficient. Most of houses are made of bamboo and tin. In some where we observed a few numbers of mud houses in this locality. There is only single room in the most of the household, a few have two which are very inadequate for them. Those house are not enough strong to tackle cyclones. Communication system of the village is not reliable. Greater portion of the road are argillaceous and rest of the roads are made of bricks. Roads are so narrow that any transport cannot move in this road. The work is bound to be of very poor standard as rain will hamper the repairs. Even culverts are not enough weal. Every year when monsoonrains come here, the riverfloods and submerges mostthe area.Villagers told usthat the frequency andintensity of the floods haveincreased over the years. And perhaps more importantly, when the floods come, the flood water stays for months. With natural drainage channels blocked by earth embankments, this effectively means that the area is water-logged for almost half of the year, disrupting agriculture, mobility, and making basic services like drinking water and healthcare very hard to access. In this area, all of them are very impecunious. Most of the year, the villages peopledo not have working space. They have only 6 months to work in their own locality. They are generally fisherman and day labor. The rest of the time, they spend outside of the area. months tillin 1 or 2work as rickshaw puller. Lack of irrigation water and salinity intrusion increases the canal water salinity. As a result, farmers of the village cannot use this water for irrigation. Saline water easily comes from the river because gate doors are damaged. Soil fertility decreases because of this and low rainfall. However, they alone are not able to address the greater landscape of climate change, local community-based approaches will also need to address other system-wide activities like access to markets, seasonal migration as an income diversifying source, and trade that could be important resilience-building activities for coastal people.